The Aurora Police Headquarters and Branch Court Facility has another award to add to its display case after being recognized by the Chicago Metropolitan Chapter of the American Public Works Association (APWA). The police facility was named APWA's "Structures - $25 Million to $75 Million" 2011 first-place award winner at the organization's annual luncheon March 24. The Police Headquarters already has been submitted for the national APWA competition by Engineering Enterprise Inc., the civil engineers for the project. The Chicago Metropolitan Award was the fifth such honor for the facility, which was entered into the competition after receiving top recognition as the Fox Valley Branch of APWA's "Project of the Year" in the Structures category. 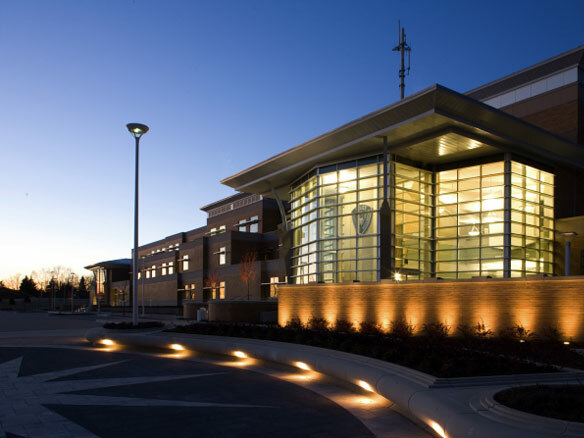 Earlier this year, the Police Headquarters earned national acknowledgment for sustainability with the LEED Gold certification by the U.S. Green Building Council and verified by the Green Building Certification Institute (GBCI). The Leadership in Energy Environmental Design (LEED) is the nation's preeminent program for design, construction and operation of high performance green buildings. In 2009, the headquarters earned the "Project of the Year" by the Construction Industry Service Corp, and the building was recognized in 2010 with the "Build to Suit Award" at the 22nd annual Chicago Real Estate Awards Dinner. Construction on the Police Headquarters and court facility, 1200 E. Indian Trail Road, was completed in 2009. The 154,000-square-foot facility is designed to use 27 percent less energy and 30 percent less water than a building of similar size and usage. The campus also includes a 200,000-square-foot parking deck and 42,000-square-foot Training and Support building.